Badges are made in many forms, ie. Metal alloy, Tin or Pewter and can be decorated with an enamel or printed finish. With or without a resin finish. If there is room, the badge can carry your company name imprinted on the reverse. 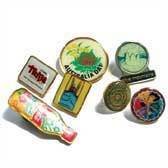 All badges are custom made to the shape of your choice. All badges come individually packed in poly bags. Please specify a size when requesting the quote.